THANKS TO EVERYONE WHO ENTERED. CONGRATS MICHELE YOU ARE THE WINNER OF THE SNACK GIFT BASKET. YOU HAVE 36 HOURS TO RESPOND OR ANOTHER WINNER WILL BE CHOOSEN. 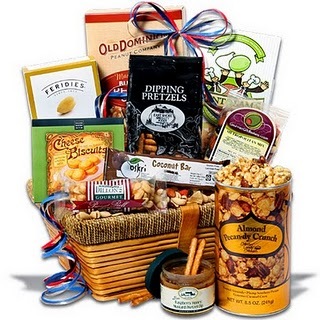 I just love the way Gourmet gift baskets are packed and all of the varies of things to eat. Gourment Gift Baskets sent me their Snack Gift Basket - Classic for me to review. I never received a gift basket from anyone before. This was my first one. I just love the snacks and sturdy wood basket. I can reuse the basket by putting my crafts or cookies. I'm always eatting some snacks. It's nice for me to snack on something light; then eatting heavy foods at night. It's a way I can maintain my weight after having my baby. I think my two year old son takes after me. He wanted to open the plastic from the gift basket to eat. It looks so good to eat. I couldn't get enough. It arrived nicely packed with no tears or dents. They shipped me their gift basket quickly. They even guarantee their baskets will arrive on time. I really do recommend buying from them. Their gift baskets are beautiful. Anyone would love to receive a gift basket or two from them. Gourment Gift Basket has generously offered to giveaway a Snack Gift Basket-Classic to one of my readers. Win it! Visit Gourment Gift Basket on Facebook. Extra Entry: mention on their Facebook wall. What product you like from Gourment Gift Baskets website? This must be done in order for entries to count! You must leave a comment that you completed the submisson. 1. Like Gourment Gift Basket on Facebook and me on Facebook. 2. Follow Gourment Gift Basket on Twitter and me on Twitter. Extra Entries: Tweet Twice a day: Enter to win a Gourment Snack Gift Basket Giveaway @ http://www.reviewitpr.com. 3. Follow me on Google Friend Connect. Visited GourmetGiftBaskets.com on Facebook :) *Thanks* for the giveaway! I visited Gourmet Gift Basket on Facebook. I follow Gourmet Gift Baskets on twitter. Following you via "Mom Bloggers Club - Goal 500 followers!" from lil-LIZ-bits, lil-bits from my Homeschooling Navy Wife Life Mom-prenuer adventures. I would appreciate a follow back! Love to see you on Facebook too! Hey! I found you on the blog hop. I love these things! I am looking forward to reading more. I also saw that you have the blog extravaganza link up. I am hoping to get into that as well! Good Luck! I would love if you came and had a look at my blog. Thanks! I liked gourmet gift baskets on face book. I left message on there site letting them know what I liked! I liked your face book page! Left a comment on Gourmet Gift baskets Wall,about my Favorite(Tami Vollenweider)! Liked Gourmet Gift Baskets & Jyla's Three Of Us on Facebook! I visited GGB's FB and Im hoping to win cause I would love to sample another product made from this company! the Winter Friends blog hop. Hope you'll swing by and visit me too. I posted on Gourmet Gift Baskets Facebook wall what basket I like. I Like Gourment Gift Basket on Facebook and me on Facebook. I left a comment on Facebook under Lisa Berkery. I like both on Facebook under Lisa Berkery. I follow on GFC under Lisa B. Yum!! Visited them on facebook and am coveting the wine basket. Following you from MBC - thanks!! I am following on GFC-Anne-Marie T.
I visited GGB on Facebook and liked the page.